Register for the Hijabi For A Day event! 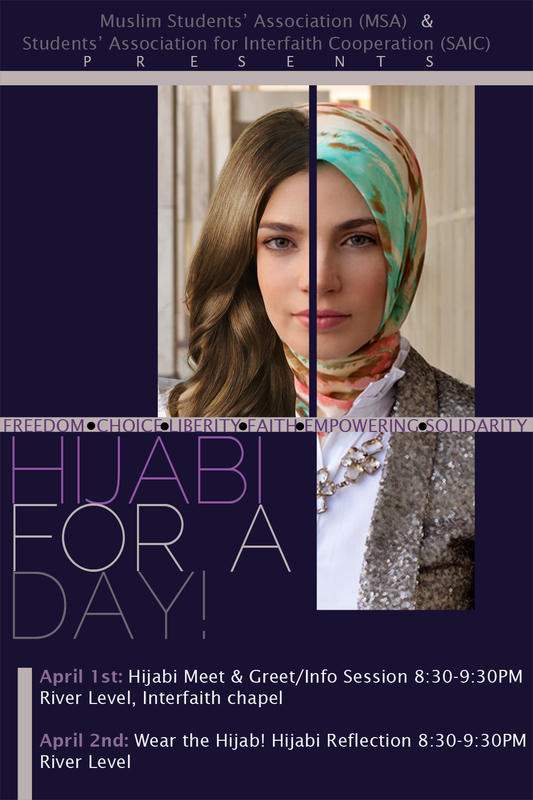 Students’ Association for Interfaith Cooperation (SAIC) and the Muslim Students’ Association (MSA) invite you to participate in their upcoming event, Hijabi for a Day. Through this program, SAIC and MSA hope to increase awareness and understanding for the hijab, a symbol of modesty, de-objectification, and commitment to God in Islam, yet one that is often misunderstood. In order to show our solidarity for women on our campus and beyond who choose to wear it, this event will give participants the chance to experience wearing the hijab for a day. Hijabi for a Day will take place on Wednesday, April 2nd; you are also welcome to attend our introductory mixer on Tuesday, April 1st and our reflection on Wednesday, April 2nd. If you are interested in participating, please sign up by March 29th using this link. If you are a female participant, you can choose to participate either by wearing the hijab or by wearing a sticker of support. If you are a male participant, you can choose to participate by wearing a sticker of support. We will provide you with more details about the the event as the date approaches. If you would like to learn more about the significance of the hijab, here are some helpful links (Hijab: Modesty, Humility, and Dignity) (World Hijab Day).